Finally! The new coop is complete. With just a few small finishing touches to make this week – it will be ready to house our chickens for years to come. It’s just in time too – as our 18 little new chicks are more than ready to move out of the temporary pen in the garage! The new chicks are getting big! They are ready for their new home. We designed the new coop to mimic a traditional mid-western farm coop – and to match the barn. We also kept with our re-use and re-purpose theme, utilizing recycled materials throughout. Just like our barn – the lower sides are made from reclaimed barn metal roofing. The board and batten top siding are made from picket fence boards. We were also able to re-use a lot of old fencing and wiring – and even the coop’s roof is reclaimed metal left over from a project. We built the coop’s door to match the design of the barn – making it from simple 2 x 6 framing boards attached to a 1/2″ plywood back. We curved the top 2 x 6 to mimic the big doors – and then filled in with picket boards to create the finished look. 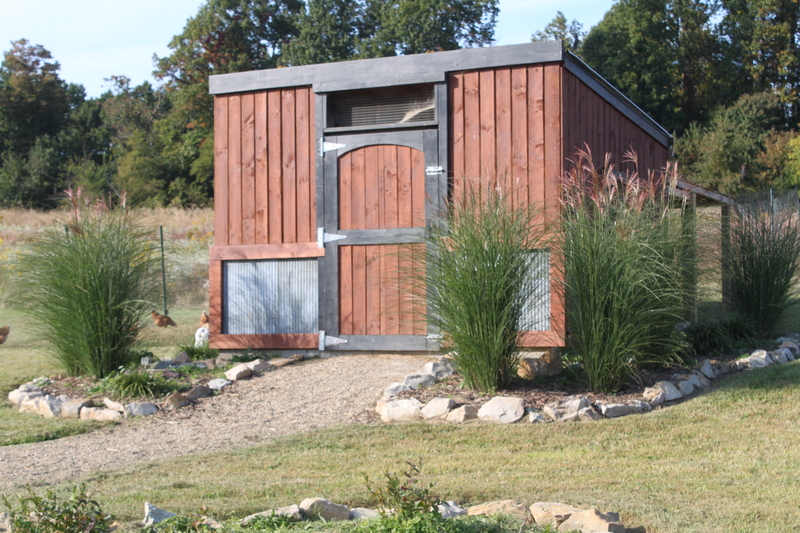 The coop measures 12′ x 10′ – and 8′ high in front, sloping to 6′ 6″ at the rear. The added space will give lots of room for the girls – and even more for us when collecting eggs and cleaning it out! 1/2″ x 1/2″ heavy gauge wire mesh covers each of the three windows. It is stapled and then backed with an additional nailed board. If you follow along, you know that in the last 6 weeks, we’ve had some intruders into our old coop that unfortunately killed some of our older chickens. It was a tough pill to swallow – especially since we’ve never had any problems in the two and a half years we’ve had them. We’re now almost positive the culprit was a mink. So in addition to proofing the new coop for raccoons, coyotes and opossum – we used tightly spaced, heavy gauge wire mesh throughout to keep out mink and weasels. We attached the egg boxes to the left and this is the first of the roosting poles going in. A secure coop starts with a secure base – for ours we used a footer made from 18″ concrete blocks placed on a 6″ packed limestone base. We then filled the blocks with concrete and embedded 1/2″ x 9″ bolts to attach and bolt through the 2 x 8″ foundation boards. We built additional security into the floor – laying down a double layer of chicken wire along with a layer of wire mesh on top of the packed limestone floor. We then secured it up and over the inside edge of the foundation and top sill board with heavy-duty staples. We then added 3″ inches of packed limestone and 4″ of packed topsoil on top to create the finished floor. Now – even if a raccoon, opossum or mink tries to tunnel under the 8″ concrete block and 6″ packed limestone base – they would still have to dig through the 3 layers of tight wire mesh and 4″ of packed earth to get into in the coop. 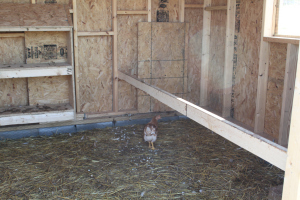 The shell of the coop is made from 2 x 4 studs – covered completely in 1/2″ strand board along with a breathable moisture barrier. We installed tight, heavy gauge 1/2 x 1/2 inch wire mesh in the windows on each side of the coop to provide for good air flow – and then added a final 3rd large mesh covered window over the top door for additional ventilation. All three windows can then be covered with plexiglass frames for the winter. The door is attached with 3 heavy-duty strap hinges and double slide bolts to prevent anything and everything from being able to pry it open. We still have some work to complete this week. The entire run – including the floor – will be encased in 1/2″ x 1/2″ heavy gauge wire mesh to prevent intruders – and will give the girls access to the outdoors 24/7. We’re also adding gutters and a rain collection system to the coop, and later this summer will attach two solar panels on the back to provide lights and a water warmer for winter. Beyond that and applying a few coats of matching barn stain to the coop – the chicken coop project can be crossed off the list!